What is Alloy 20 Pipe Fittings ? 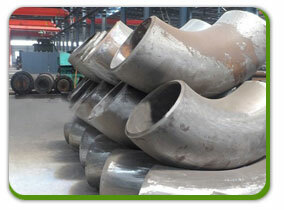 Aakash Steel is a full line manufacturer and supplier of Alloy 20 Pipe Fittings in the country. We are highly appreciated for our excellent quality products and extraordinary services. Our products are known for their superior quality, excellent strength and extended durability. We also export our products to various countries and our clients are established throughout the globe. We have served industries like chemical, marine, nuclear, oil and gas, paper and pulp etc. An ISO 9001:2008 Certified Company, Aakash Steel is offering Stainless steel Alloy 20 pipe fittings are available in the size range of ½” NB to 8” NB. For sizes above 8”NB, we offer our customers with seam welded 100% radiography tested Alloy 20 pipe fittings. Aakash Steel offers a complete range of Alloy 20 pipe fittings such as Alloy 20 reducer, Alloy 20 elbow, Alloy 20 tee, Alloy 20 cross, Alloy 20 stub ends and Alloy 20 pipe bends. Exports is Our Specialty! and we can source many hard to find grades and or non-standards sizes to meet the special requirements of our customers. All Alloy 20 Pipe Fittings can be cut to size with the help of our extensive expertise in processing steel plate products. Orders at Aakash Steel are guaranteed fast delivery of the Alloy 20 Pipe Fittings in the country. The main reason being we have an excellent warehousing and storage facilities for both finished and semi finished goods.They are made ready as per the urgent requirements of the customers. TheAlloy 20 Pipe Fittings are manufactured to sustain very high pressure and product warranty.In 2016 we have stocked 4 tons ofAlloy 20 Pipe Fittings in all sizes, to cater to immediate delivery and urgent needs of the clients. For small requirements we can dispatch the Alloy 20 Pipe Fittings immediately against the purchase order. We are an eminent manufacturer, supplier, exporter and trader of Alloy 20 Pipe Fittings.We specialise in the manufacture and supply of Alloy 20 pipe bends in both standard and non standard sizes, with bending radius of 1D to 10D. Each order is packaged according to the customer’ s standards including preparation for export such as wooden case, pallet or according to customer’s requirement All shipping documentation is provided for Alloy 20 Pipe Fittings delivery from mill to customer.